With one day left before Brexit was originally due to happen, there's still no sign of the government getting its withdrawal deal through Westminster. The success of Theresa May's deal rests mostly on one thing: persuading her allies in the Democratic Unionist Party (DUP) to vote for it. But that is proving the prime minister's toughest task to date. Despite her offer to step down if MPs back the deal, the DUP insists it will not vote for it. The party's 10 MPs have voted against the deal twice before, warning that the plan as it stands poses a risk to the integrity of the union of the United Kingdom. They oppose the Irish border backstop in the Brexit deal - the insurance policy to maintain an open border on the island of Ireland unless and until another solution is found. The DUP believes if it took effect, it would cause trade differences between Northern Ireland and Great Britain, and create a "border down the Irish Sea". What is DUP's Brexit talks hope? As I have written before, the DUP takes pride in placing the union above all else. Although the party has been involved in negotiations with ministers to see what it would take for the DUP to back the deal, it has yet to inch towards giving the government the green light. DUP sources describe as "offensive" the suggestion that more money could sway them. 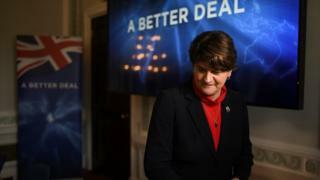 The party came to prominence after 2017's snap election when it negotiated £1bn for Northern Ireland in exchange for entering a confidence-and-supply pact. That arrangement is due to expire this year - but the DUP insists it has not asked for cash in these Brexit talks. But what has the party asked for? Officially, the DUP says it won't provide a running commentary while discussions are ongoing. In one sense, though, its stance has shifted slightly. Last November, at the party's annual conference, deputy leader Nigel Dodds demanded that the government "bin the backstop". 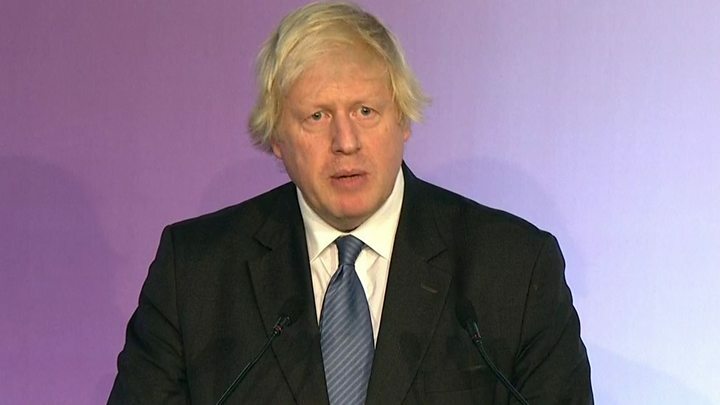 He was supported that day by the appearance of ex-Foreign Secretary Boris Johnson, who said it was time for the backstop to be "junked". More recently, that call has disappeared in favour of calls for legally binding assurances or changes to it, within the withdrawal agreement. DUP sources have also not ruled out suggestions the party has asked for a role in future UK-EU trade talks (the second Brexit phase), and the return of the so-called Stormont lock. What is the Stormont lock? It means the UK government would offer Northern Irish politicians a say, or possible veto, on the rules that apply to Northern Ireland in the backstop, and whether rules in Great Britain and Northern Ireland are allowed to diverge. This would create a formal mechanism for consulting and seeking the approval of the devolved administration at Stormont in the backstop. However, the Stormont institutions collapsed in 2017, after a row between the power-sharing parties. The government had previously offered this proposal in January, but has not made clear how the lock would be given legal force through the EU withdrawal bill. At a glance, it seems difficult to imagine the circumstances in which the UK government or EU would agree to either of the DUP's requests. In the meantime, the prime minister still has to face the parliamentary numbers. She needs 75 Conservative MPs, who voted against her deal earlier this month, to back it third time round. Not all of them will, so she is relying on the 10 DUP MPs too. High-profile Brexiteers like Jacob Rees-Mogg had caveated their support for any deal by saying they will only vote for it, if the DUP does. Now that the PM has said she will step down if her deal gets through, Mr Rees-Mogg has said he will back it, if the DUP abstains. That begs the question: are these Conservative rebels changing their minds on the deal, or just hoping to pass the blame to the DUP, if a deal isn't agreed? The DUP will be acutely aware of this possibility. This week, the party's Strangford MP Jim Shannon suggested that some Tories would prefer any form of Brexit soon, rather than protect the union and risk a long delay to the process. The DUP might be in an increasingly small corner, but the latest Brexit developments could end up strengthening its resolve to resist the deal. Eagle-eyed Commons watchers will have noticed that during Prime Minister's Questions on Wednesday, the DUP MPs did not ask Mrs May about Brexit, instead focusing on resources to tackle dementia and the Belfast city deal commitments. That is surprising, and maybe an indicator that the DUP isn't prepared to totally oppose the PM. But it also could just be a rare moment of détente. If Mrs May can unlock the DUP's support, she could in theory bring with them, a swathe of Tories from the Eurosceptic European Research Group (ERG) onto her side. That will be tempting, but so far there's no sign the government has any 11th hour carrot - or stick - to wave at the DUP. There's also scarce internal pressure - or even calls from grassroots unionism - for the party to change its mind. The DUP famously spent years saying "no" and "never" to situations and deals it did not approve of, in Northern Ireland politics. For the moment, it may well feel it can afford to keep saying no.